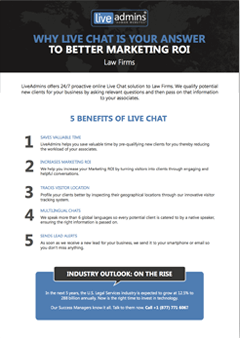 LiveAdmins offers 24/7 proactive live chat solution to law firms which helps them in connecting with prospective clients in real-time. We qualify potential leads for your business who are seeking legal advice and assistance, and then pass on their information to law experts at your firm. LiveAdmins reaches out to the potential new clients on your website and connects with them to get you more business. Our technology tracks if there is a returning visitor on your website and will then serve them with a more personalized experience. If there’s a new client, our chat-to-phone technology help the visitor connect with your office in a matter of a few seconds. We engage visitors with chat before they have a chance to leave your website and keep your business stay online 24/7. On which devices does live chat works? Be it a desktop, tablet or mobile – our chat windows are fully responsive thereby delivering optimum visitor experience. Can your agents connect chat visitors to our office by phone? Yes. Through ‘Handover’ our agents can directly connect website visitor to you through phone call in matter of seconds. The service is designed in such a way that it would not stop regardless of what the problem is. Unless there is an issue from the customer’s side, any issue can be settled immediately by fixing bugs or by shifting workload to another area. Fill out this form now to see how our solutions can make a difference to your law firm.